For over sixty-five years, Polish audiences have delighted in the weekly cultural tradition of classic and contemporary theatre broadcast live into the homes of millions. Poland prides itself on its rich and varied cultural landscape, and its offers in film and literature are well-known – as is its theatre tradition – but for many Poles, front and centre of the cultural repertoire is the rather strange television theatre. For over sixty-five years, Polish audiences have delighted in the weekly cultural tradition of classic and contemporary theatre broadcast live into the homes of millions. Transmitted several times a week, the dramatic artform – a concept pretty much foreign to anyone outside of Poland – has been a cultural touchpoint for decades, fuelling more than one conversation around the water cooler. Emerging simultaneously alongside television itself, television theatre was understood to be part of the general programming, rather than an independent phenomenon, but certain conditions meant it maintained a strange individual quality: the communists disparaged all elitist pursuits – something that theatre very much represented – which left the art form in an impoverished state. When theatre appeared on TV in 1953, it was a stripped-back, fully bohemian undertaking with a minimal budget – something that still determines its artistic production today. Jan Tomaszewski, advisor to TVP1’s board, who produce the long-standing theatre productions, considers this particular set of circumstances to be part of its ongoing appeal. “For me, this theatre is the absolute peak of artistic creativity – connecting painting, acting, music, literature, spatial creativity and dance. It’s power lies in its capacity to pull people in close. It requires focus, and teaches thinking. We watch soap operas while we drink tea, but we watch TV theatre as a celebration – a real experience,” says Tomaszewski. Such was its popularity in communist times, the state power supply had to flood the grid just to be able to facilitate each live broadcast. Now when the death knell is ringing for TV itself, the regular performances of literary staples and cult classics can still bring in a viewership of over 1 million. This celebration, Tomaszewski believes, is why TV theatre is also a community-building exercise. At a time when Netflix allows the viewer to choose their own adventure, the TV theatre productions enters the homes of millions, making it a cultural focal point. ‘When I speak to my friends about the TV theatre, it turns out that most of them watch it regularly, because they have this need, and they get a lot of pleasure from watching it. Because of the limitations of production, we need to focus on making excellent material and getting great performances from our actors,” he says. 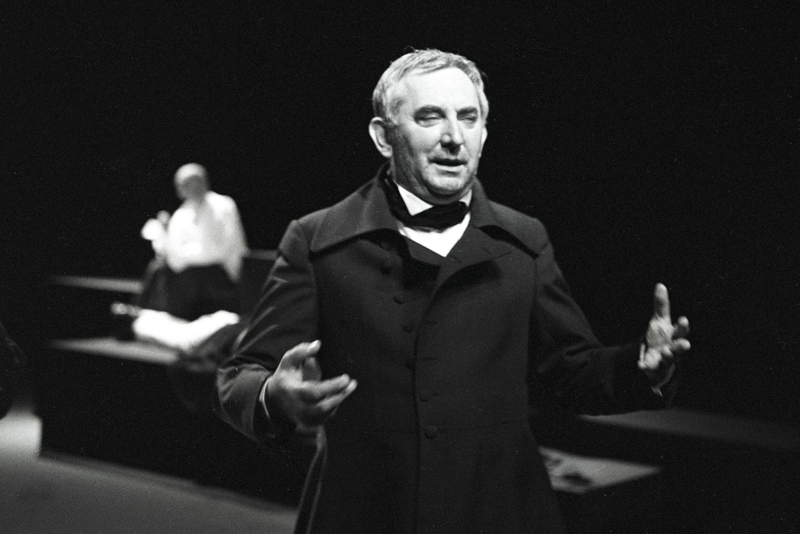 In its 65 years the programme has put on thousands of performances, during which it has racked up an impressive list of literature: anything from The Crucible and Hamlet to the Three Sisters. The live theatre repertoire for 2018 is in itself ambitious with a focus on Polish literature and plans to put on performances of international, classical and contemporary works. But more significantly, Poland's public television is hoping to expand on the tradition by going further. A new theatre program is set to start airing live on a cognate channel, but for a new audience: Polish children. With a new generation being invited to participate in the weekly rituals, the tradition looks set to continue for some time yet.